As he shows me around my spacious suite, my butler Gregg is explaining the range of services his team is ready to do for guests – from unpacking suitcases and ironing to drawing aromatherapy bubble baths at a chosen time or even as a surprise. Here, outdoor space is as much of a focal point as the interior of the rooms, with private fenced in patios covered in foliage, complete with plunge pools, hammocks for two suspended from coconut trees, outdoor rainfall showers, ample places to hang out in the great outdoors, and the occasional visits from hummingbirds. Suites range in size from 1,250 to 1,900 sq. ft., centering around handcrafted mahogany king beds. In-room dining and cocktails can also be arranged for couples and any new friends made during their stay. Aside from the rooms, the main attraction of Serenity is the pool, which already has several accolades to its name. 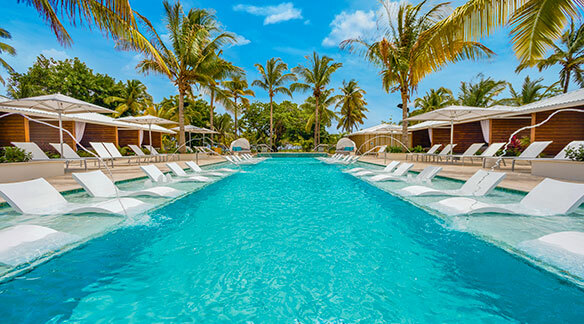 There are cabanas and day beds, and by night, the pool is illuminated and colourfully lit fountains shoot into the pool. With Saint Lucia’s popularity as a honeymoon destination, Adams says the resort has been popular for newlyweds and couples alike. Special delivery: for those who are feeling peckish while going au naturel, a private room service box allows the butler to deliver food without entering the suite, so guests don’t have to get dressed to fetch breakfast. Instagrammable moment: a shot in the hammock – with room for two – will ensure plenty of likes. Eat this: once a week at the on-property restaurant the Greathouse, a family-style chef’s dinner is prepared by Aunty Debbie, a local chef who is also known to serve up a side or two of song. Unwind: rather than sauntering over to the spa, guests can get the masseuse to come to them for an in-suite massage. Drink this: breakfast isn’t complete without trying one of Gina’s freshly made juices. A special touch: guests can expect nightly handwritten notes during turndown service. Did you know? Serenity and Coconut Bay have a farm to table approach to dining, with a green house on-site where they grow tomatoes, lettuce, broccoli and even mint. 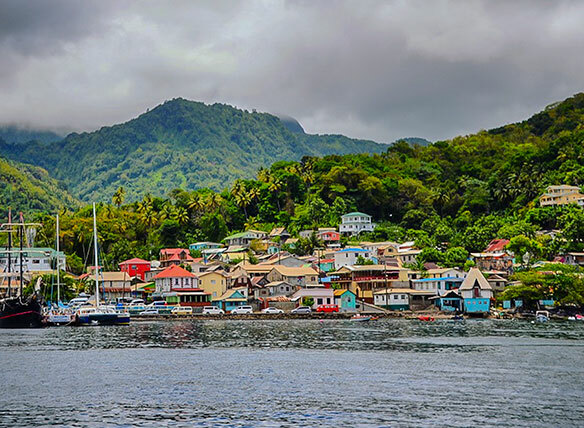 Don’t leave Saint Lucia without: getting muddy (and posing for photos) in the sulphur springs; seeing The Pitons – the two volcanic mountainous peaks near the town of Soufriere – from the water; and having a Piton (a local beer) by The Pitons. Oh, cabana: for a special beach-side experience, guests can book oceanfront beach cabanas for a full or half day. Butlers transport guests via golf cart with a picnic lunch and a cooler stocked with beverages. Seeing Saint Lucia: for clients who want to take in the sights and experiences around Saint Lucia, the resort offers many excursions exclusively for guests of the two properties. Value added: due to the success of its Grand Romance Package, Serenity is leaving the promotion in place for 2018 and 2019. The package has many inclusions with a seven-night stay like a sunset champagne and jazz catamaran cruise.